The key differentiator for IoT is the data collected and the use of this data to improve business operations, products, support, and customer experience. Many companies have already connected their equipment or assets and begun collecting data. The challenge is how to leverage the data to realize the true benefits of IoT, not only for the companies’ specific uses, but also to extend the information to auxiliary businesses. There will be two key components to evolving IoT to its true potential. In this white paper, discover the two key components and how a data exchange can be used to realize both components. 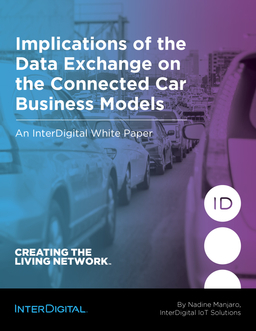 Implications of the Data Exchange on the Connected Car Business Models An InterDigital White Paper By Nadine Manjaro, InterDigital IoT Solutions www.InterDigital.com | 2 The key differentiator for Internet of Things (IoT) is the data collected and the use of this data to improve business operations, products, support, and customer experience. Many companies have already connected their equipment or assets and begun collecting data. The challenge is how to leverage the data to realize the true benefits of IoT, not only for the companies? specific uses, but also to extend the information to auxiliary businesses. There will be two key components to evolving IoT to its true potential. The first is the analysis and interpretation of historical and real-time data that will trigger effective actions and improve business operations. The second is exposing collected data to developers to create new capabilities not yet envisioned. The new solutions or applications can be sold in a marketplace enabled by the data exchange. A data exchange can be used to realize both components. Today, there are hundreds of IoT platforms on the market and many different data analytics and storage options. However, there are currently no centralized means of aggregating data from disparate data sources and making this data available to third-party companies for analytics. Hence, the data collected is typically not used to its full potential. A data exchange enables sharing of data across business units within an enterprise and across different industries that ultimately create these new possibilities. A data exchange links disparate data sources and creates new business models around data access and utilization. Providers can open their data for free use or charge for premium data access. The architecture in turn is similar to an IP exchange where data is aggregated at a few central hubs via an orchestration platform, which then presents anonymized data in a common standard format to third-party developers. Companies can continue to use their own data more efficiently for internal purposes while also making anonymized data available for external use. Companies like General Motors (GM) have collected vast amounts of data from connected cars, so how can they further grow their businesses and capitalize on this data? To start, they are turning to companies with extensive backgrounds in data analysis. These companies are staffed with actuaries and data scientists, and their core business is to make sense of vast pools of data. By collaborating with third-party companies, GM and other automotive manufacturers free themselves to focus on their own core business, making high- performance, safe vehicles, while their partners develop further business insights from the vast data collected. Implications of the Data Exchange on the Connected Car Business Models www.InterDigital.com | 3 Role of Automotive Original Equipment Manufacturers (OEMs): In 2015, the US auto market alone accounted for 17.5 million vehicles, or approximately 20% of global sales1. According to McKinsey and other sources, connected cars generate an average of 25GB of data per hour. This means that the 7 million OnStar customers generate up to 175 million GB of data every hour. If all of these vehicles were connected, just imagine the amount of data generated! This does not include the existing after-market pool of vehicles in the US and elsewhere. GM is looking to expand its $350 million connected car profits by enabling access to its vast amount of data2. The company signed a data sharing agreement with Verisk in September 2015 to enable third-party access to its data3. Verisk is an auto insurance intermediary specializing in risk management, with strong capabilities in data analysis. Similarly, Toyota announced that all vehicles sold in the US and Japan markets will be equipped with wireless modules (DCM) starting in 2017, and will connect to Toyota?s big data center4. Finally, Ford is adding LTE modules to its vehicles while Volvo features over 200,000 connected cars tied to its cloud data depository. This makes the overall connected car industry an enormous data source already ripe for a data exchange. Summary of Major Automotive Companies? Connected Car Activities: Auto OEM Connected Product Number of Connected Cars Big Data Strategy Notes GM OnStar Reported ->23,000,000 connected vehicles; 7 million paid customers Signed agreement with Verisk in 2015 Verisk exchange is expected to have 1.3 million GM cars by end of 2016 Ford Sync, My Ford Touch Plan to connect 10,000,000 over 5 years Ford has an opt-in model for collecting data from connected cars; announced partnership with IBM for data analytics Expect to add another 10 million by 2020 globally Tesla Motors 64,000 Started with a connected car strategy Plan to grow to 500,000 vehicles by 2018 Volvo Sensus 200,000 Volvo connected cloud Sensus, Volvo?s in-car infotainment system Toyota Toyota Connected Ventures 5,000 Formed partnership with Microsoft for data analytics. Plan for global data centers to collect DCM data; partner with KDDI for connected car platform Mercedes mBrace Using Pivotal Cloud Foundry www.InterDigital.com | 4 Role of Insurance Companies The insurance industry will be seeking opportunities and new revenue streams as more and more auto OEMs equip their vehicles with connectivity and autonomous driving capabilities. Self-driving vehicles will reduce the probability of accidents, which will in turn change the insurance premium models used today. Autonomous vehicles such as those announced by Lyft, GM, Ford, Google and others will significantly change the insurance industry as we know it today. New questions such as liability in self-driving vehicle collisions are being debated by regulators and policy makers across the globe. It is expected that self-driving cars will shift accident liability from driver to the auto Original Equipment Manufacturer (OEM), which will thus revolutionize the insurance industry. Today, several large and small insurance providers offer Usage-Based Insurance (UBI) solutions. These include Progressive?s Snapshot market leader, State Farm?s Drive Safe & Save, and Allstate Drivewise. Most of these solutions leverage onboard diagnostic port (OBD) devices and smartphones to collect driving behavior data. Newer vehicles will be factory-equipped with wireless modules to capture both driver behavior and data on the entire vehicle lifecycle. For example, Toyota announced in January 2016 that it will begin installing wireless modules in most 2017 vehicles sold in the US and Japan5. Data from these modules will be collected in a new centralized data warehouse for analysis and predictive modeling. These solutions will provide insurance companies with actual driving data versus statistical averages, credit score and other less-relevant factors used in the past to determine insurance premiums. Insurance companies will now be providers of personalized, specific data to third-party intermediaries while being subjected to privacy guidelines as mandated by each state. Role of Intermediaries Intermediaries such as Verisk will act as master aggregators, interpreters and presenters of data. They will work with platform companies to create the ecosystem and architecture to collect data from disparate systems and aggregate, analyze, and then interpret that data. They will become data brokers to companies collecting large volumes of data such as GM, alarm/security companies, manufacturers, and logistics companies. Then they can also market, promote and capitalize on both raw and premium data (such as those where various analytic algorithms have been applied). www.InterDigital.com | 5 Key features of a data exchange: ? Scalable, flexible architecture ? Open source (system of systems) ? Data extraction ? Data aggregation ? Data model exchange between different domains ? Data orchestration from disparate sources ? Third-party platform licensing to simplify patent sharing agreements (Ericsson) ? Identity and access management ? Marketing automation (simplify adding solutions to the marketplace and billing) ? E-commerce capabilities Architectural Requirements IoT data exchange can follow an architecture similar to that used by European Radiological Data Exchange Platform (EURDEP), where over thirty-eight European countries continuously share radiological data in near real-time. The data exchange would act as a peering point for data providers. Data providers can collect information from their own networks and share it with the exchange in real-time or as needed. A data orchestration platform would connect the different data sources and enable seamless data exchange similar to EURDEP. The orchestration platform would include APIs or adaptors to enable easy integration of third-party systems, Enterprise Resource Planning (ERPs) and other enterprise systems. In the figure shown, each node represents different enterprise systems or IoT platforms. Data sources can be databases, the web, or other data repositories. The exchange is the suite of adaptors needed to integrate the different nodes, similar to the capabilities provided by InterDigital?s wot.ioTM platform. This will simplify data aggregation across the networks used by the intermediaries and their partners. Other architectural components include billing, rating and access tracking. Data providers would connect to a peering point and the peering partner would ensure the integrity and normalization of the data. Key features of a data exchange may not all be available in one provider?s solution and therefore may need to be packaged from different partners into a comprehensive offer. Not all features are required to launch an IoT data exchange, but this is an optimal feature list. Data Exchange Exchange Node 1 Node 2 Node 3 Node 4 Data Source 6 Data Source 1 Data Source 4 Data Source 3 Data Source 5 Data Source 2 www.InterDigital.com | 6 Security Requirements Recent security breaches, such as hackings of the Nissan Leaf and the Jeep Cherokee SUV in 2015, are highly publicized and have resulted in the recall of 1.4 million vehicles6. They highlight the need for end-to-end security in all IoT solutions, especially where safety is concerned. In a data exchange, APIs are exposed to third-party developers to enable access to third-party data while also enabling different systems to communicate and share information. Therefore, it is essential that API and data access are secured to protect the integrity of the data and privacy of data providers. It is also essential for passenger and public safety. Some of the security solutions also require Identity and Access Management, API Management, and Secure Key Infrastructure to verify endpoint identity. Data Sharing Agreements Companies participating in data exchanges will need to sign data sharing agreements which specify the rules of data sharing and various financial terms. Each data contributor will define its required compensation. Metering infrastructure will capture data use and billing details. Partners can be added and removed as needed. Security mechanisms will also be in place to ensure access is authenticated and limited to authorized users. Data may be charged by tiered access, such as bronze, silver and gold. Each tier will limit the number of requests or transactions per minute and charge accordingly. For example, bronze may be limited to 4 transactions per minute while platinum may be allowed 25 transactions per minute. This will vary depending on how the customer chooses to implement the solution. Charging for data access is one of many revenue models supported on the platform. Platforms such as InterDigital?s wot.ioTM enable a wide variation of implementation options and provide the foundation for creating a marketplace as well as interconnecting with third-party analytics and other systems. For more information on InterDigital?s IoT solutions, visit: www.interdigital.com/iot. Conclusion A data exchange would enhance the connected car business model by allowing data owners to market, promote and capitalize on their data. It would position the IoT to reach the its full potential. Third-party companies with expertise in analyzing and marketing data will play a key role in the evolution of IoT businesses through data brokerage and the creation of a new data marketplaces. Not only will a data exchange enable auto companies to improve vehicle performance and manufacturing, but it will open new opportunities for supporting both consumer and enterprise-level services. Attributes supported by the Security Model: ? Authentication: proving your identity (prove human and/or device identity) ? Authorization: establishing who can access what ? Availability: ensuring that the server can accommodate requests ? Integrity: ensuring data is not modified ? Confidentiality: protecting data that needs to be protected ? Non-repudiation: confirming who sent the message ? Auditability: accounting for data access ? Identity propagation: transmitting identity from one system to another www.InterDigital.com | 7 About InterDigital? For over 40 years, InterDigital has been developing solutions that are at the core of networks, devices and services worldwide. We solve many of the industry?s most critical and complex technical challenges, inventing solutions for more efficient networks and richer user experience years ahead of market deployment. InterDigital has licenses and strategic relationships with many of the world?s leading companies. InterDigital is listed on NASDAQ under the ticker symbol IDCC. InterDigital, Inc. is a registered trademark of InterDigital, Inc. Wot.io is a trademark of InterDigital, Inc. All other trademarks, service marks and/or trade names appearing in this brochure are the property of their respective owners. 200 Bellevue Parkway, Suite 300, Wilmington, DE 19809 | +1 (302) 281-3600 References 1. Bennett, Jeff; Spector, Mike. (2016, January 5). The Wall Street Journal. US Car Sales Sets Record High. 2. Dana, Mike. (2015, September 29). Fierce Wireless. GM CEO: We plan to capitalize on the connected car opportunity. 3. Verisk Press Release (2015, September 2), Verisk Insurance Solutions Announces GM as Inaugural Auto Manufacturer to Join Telematics Data Exchange. 4, 5. Goodwin, Antuan (2016, January 4). CNET. Toyota adding cellular data connections to ?a broader range? of vehicles by 2017. 6. Ribiero, John (2016, July 13). PC WORLD. Chrysler launches bug bounty for connected vehicles after Jeep Cherokee hack.